Check out these Teacher Appreciation Crafts! 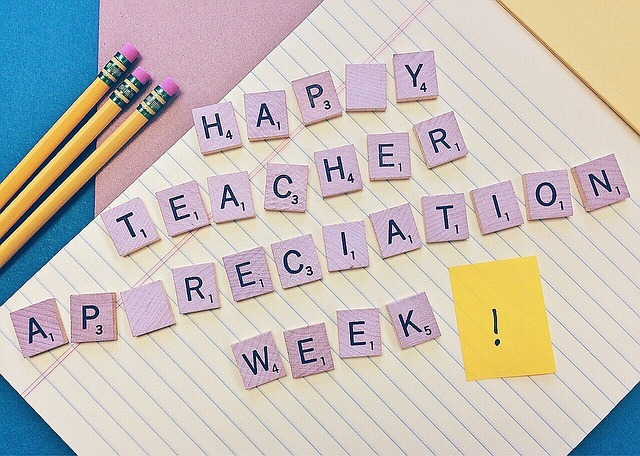 Teacher Appreciation week is traditionally the first full week in May (unless your school does something different). We have not seen nearly the deals this year that we have in the past but there is a nice ongoing list of deals on the bottom of this post. Bruegger’s Bagels: As part of this year’s Teacher Appreciation week (May 7-11), Bruegger’s will help students and parents celebrate teachers by offering 20 percent off catering – perfect for a teacher’s break room feast of bagels, cream cheese and coffee – and a free egg sandwich of choice with the purchase of a $25 gift card— a great gift for that teacher who is worth a (big bagel) bundle. 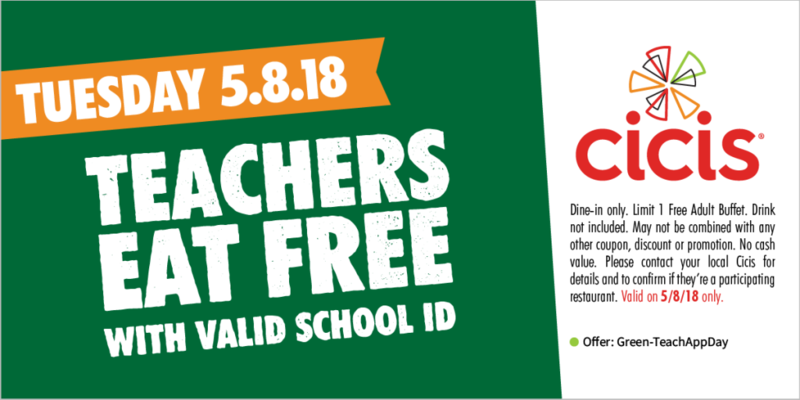 CiCis: On May 8th CiCis would like to thank all teachers by offering them a free adult buffet with a valid school ID and coupon. Chipotle: In honor of teachers and their hard work, we’re giving all educators BUY-ONE/GET-ONE FREE BURRITOS, BOWLS, SALADS, OR ORDERS OF TACOS. Teachers, faculty, and staff: bring in your school ID to any Chipotle in the U.S. on Tuesday May 8th from 3pm-close and we’ll hook you up. Valid only on Tuesday, May 8, 2018 between 3pm and close at participating U.S. and Canada locations. Limit one free entree item per customer with teacher ID, subject to availability. Free item requires purchase of an entree item of equal or greater value. Valid teacher ID includes: ID or other documentation from preschool, elementary school, middle school, high school, community college, or university identifying as faculty or staff, or home school ID card. Chick-fil-A: I am seeing LOTS of local deals on Chick-fil-A. These are going to vary by location. Just check the social media for your local ones and you should be able to find all the details. Cinema Cafe: We’re giving teachers free admission on Tuesday, May 8th! Show your Teacher ID at the box office tomorrow to get your free ticket. And thanks for all that you do. PDQ: For Teachers + Nurses Appreciation Day, on Tuesday, May 8th, PDQ will thank those dedicated to bettering our communities with 50% off their total check (valid ID required). Sugar Shack Donuts and Coffee: Free house donut? Did you know its also Teacher Appreciation week? Show us your school faculty ID today for a free donut! 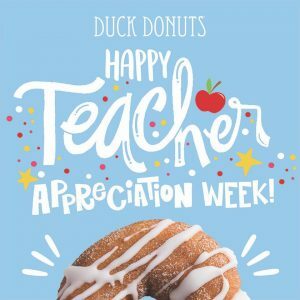 Donut forget nurses AND teachers earn 30% off all week! Also, with Mother’s Day right around the corner you may want to pre-order your donuts like our Honey Lavender glazed donut! May 11-13 only! Zinburger: the upscale burger concept that offers gourmet burgers combined with perfectly paired wine selections, is offering a free shake on Tuesday, May 8 to teachers and administrators at all of its 15 east coast locations. NEA members save 20% at 1-800-Flowers – just sign into your NEA account to access the discount. To receive a teacher’s discount (15% off your entire purchase), simply present one of the following credentials at checkout: State Issued Photo ID, School ID, Home School Affidavit or IHIP approval letter from School District or your state, Home Schooling Certificate, or State Issued Preschool/Daycare Facility Certificate/License. A.C. Moore suggests asking your store or emailing [email protected] to find out more details about the program. Are you a teacher who is also a student? If you have a .edu e-mail address you can get Amazon Student FREE for six months! During that six months there are a few benefits, the biggest being FREE 2 Day Shipping on thousands of items. There are also exclusive discounts and promotions- many of which involve textbooks both for rental and purchase. Register as an Ann Taylor Loft teacher to receive 15% off your full-price purchase in-store, everyday! Offer must be presented at time of purchase and you must show a valid Teacher ID. Apple offers special education pricing on Apple computers, software and select third party products to college students, parents buying for a college student, or teachers, homeschool teachers, administrators and staff of all grade levels. Students who have been accepted to college are also eligible. Monthly qualified wireless service discount (up to 17%) for teachers and faculty – if your address matches their list of qualified education organizations, they will email you with instructions on how to start saving on AT&T wireless services and devices. NEA members get a 15% monthly discount, among other perks! 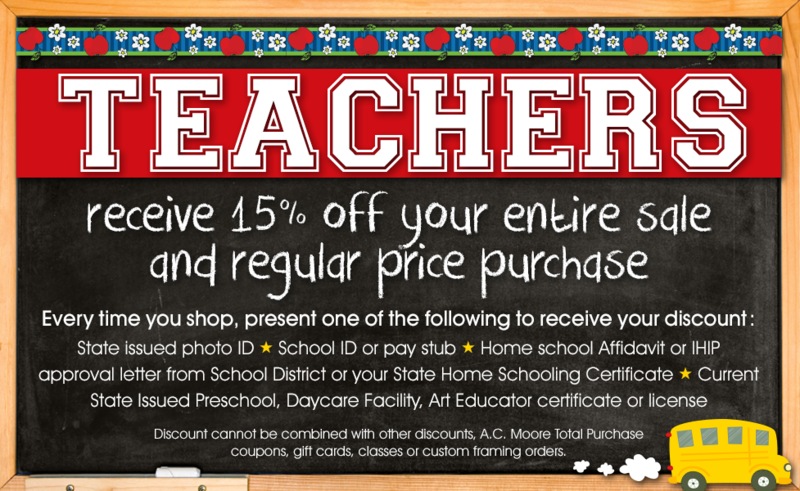 All teachers receive 15% off any in-store purchase with a valid school ID. This applies to full-price items only. All year-round, save 20% off the publisher’s list price on all purchases for classroom use, get up to 25% off the publisher’s list price during Educator Appreciation Days, and receive valuable email offers and information on special Educator events. They offer educators special discounts throughout the year to help organize your classroom! Just complete the form to receive your first offer, redeemable in-store, online or by phone. Program ends December 31, 2015. The spirit of teacher appreciation gets educators 25 percent off their gel mat purchases through the end of 2018. Free discount card for 15% off every purchase (excludes remnants, patterns, gift cards, and previous purchases). Bonus coupon for 20% off any one total purchase when you enroll or re-enroll in the program. More of their popular, money-saving coupons as a Jo-Ann Preferred Customer. After a short verification process, students and teachers can take 20 percent off all purchases any time. Teachers and students are among the select groups that can take 20 percent off exercise membership purchases. Join the Lakeshore Learning Teacher’s Club and receive 15% off on hundreds of classroom items every day. Lenovo’s Academic Purchase Program assists students and faculty to find discount laptops, tablets, and desktop computers. If you’re a member of the NEA, you can access more than 900 magazines at up to 85% off the cover price. Did you know that the National Parks Service offers a ton of materials that you can borrow? From DVD sets to games and hands-on “Field Trips in a Box,” they will loan you great material for your classroom. Teachers receive 10% back on most classroom supplies. Party City offers a 10-20% school/non-profit discount (depending on the size of your purchase). Just provide them with a letter, signed by an officer of your school or organization on official letterhead and pay with a check or credit card in the name of the company or organization. Scholastic offers a special online store for teachers with terrific discounts, up to 75% off! They offer a 20% discount to K-12 educators to help offset the cost of books from their Young Adult, Children’s and Education sections. The program is available to fully certified K-12 educators working in Michigan. Educators in Texas, Florida, Arizona and California can get FREE Fun Passes plus some other perks! Staples offers a special Rewards program for educators. Benefits include 5% back in rewards, and 10% back in rewards on teaching and art supplies. Plus, get free shipping on every staples.com® order. The Walt Disney World Swan and Dolphin Resort offers teachers and all school support staff a very special room rate. Teachers receive free admission every day at Perot Museum of Nature and Science in Dallas, Texas. Just fyi.